ST. MEINRAD, IN – Archbishop Daniel M. Buechlein, OSB, 79, monk and priest of Saint Meinrad Archabbey and archbishop emeritus of the Archdiocese of Indianapolis, died at 12:20 a.m. on January 25, 2018, in the monastery infirmary. Archbishop Buechlein served as the fifth archbishop of the Archdiocese of Indianapolis from July 14, 1992 until his retirement on September 21, 2011. Surviving are his brother, Charles, of Jasper, IN; and nieces and nephews. He was born in Jasper, IN, on April 20, 1938, to Carl and Rose (Blessinger) Buechlein and given the name Marcus George. He joined the monastery on August 14, 1958, and professed his simple vows on August 15, 1959, taking the name Daniel. He made his solemn vows on August 15, 1962. He was ordained to the priesthood by the Most Rev. Paul Schulte on May 3, 1964, and celebrated his first Mass on May 24 at Holy Family Parish, Jasper. After his ordination, Fr. Daniel spent two years in Rome, where he obtained a Licentiate in Sacred Theology with a specialization in liturgy at the International Benedictine University of Sant’ Anselmo. Returning to Saint Meinrad in 1966, he served as assistant dean of students and chairman of the Division of Religion at Saint Meinrad College. In 1971 he was director of the first national conference for seminary spiritual directors, and coordinated the founding of the Midwest Association of Seminary Spiritual Directors. That same year, he began 16 years of service as president-rector of Saint Meinrad School of Theology, the last five of which he also served as president-rector of the college. In addition to serving many elected terms on the Archabbot’s Council during this time, he taught courses on priestly ministry and spirituality. On January 20, 1987, Pope St. John Paul II announced the appointment of Fr. Daniel as the third bishop of the Diocese of Memphis, TN. His ordination and installation took place on March 2, 1987. 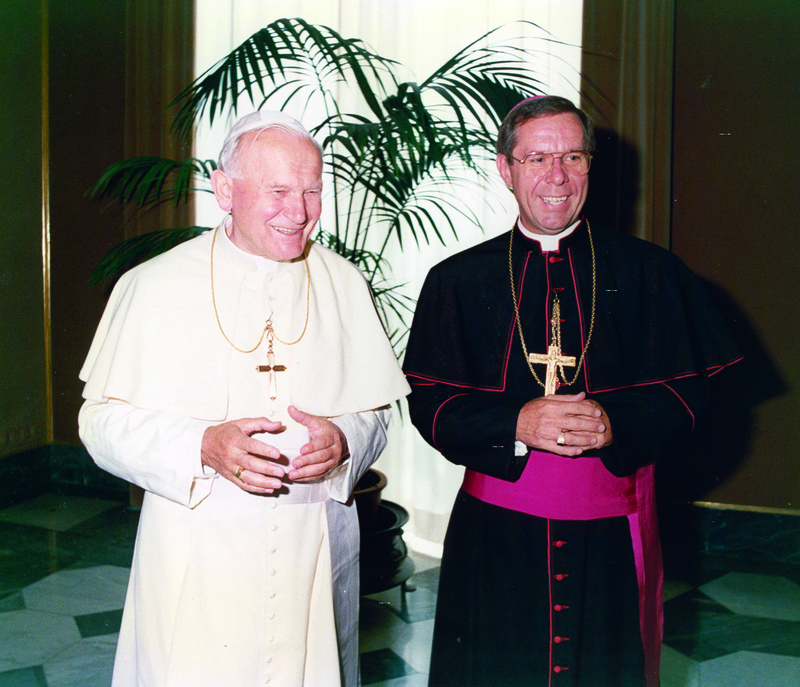 On July 14, 1992, Pope St. John Paul announced that Bishop Daniel would succeed the Most Rev. Edward T. O’Meara, who had died that January, as the 11th bishop and fifth archbishop of Indianapolis. On September 9, he was installed as archbishop in the Cathedral of Saints Peter and Paul. He was invested with the pallium by the Holy Father at St. Peter’s Basilica in Rome on June 29, 1993. During his 19 years as shepherd of Indianapolis, Archbishop Daniel worked to strengthen the archdiocese’s pastoral, spiritual and financial health. He was especially interested in promoting Catholic education, young adult ministry, and vocations to priesthood and the religious life. Under his leadership, enrollment in the archdiocese’s Catholic schools increased 30 percent to more than 25,000 students, reversing a 25-year decline. Innovative partnerships with Lilly Endowment Inc., campaigns to help fund new education initiatives, and the support of the business community led to improved student performance, which the U.S. Department of Education recognized by awarding 26 archdiocesan schools with Blue Ribbon awards for excellence. Archbishop Daniel garnered support to keep Catholic schools in the Indianapolis center-city open to serve students from low-income families and the growing immigrant population. He also led the effort to build two new grade schools in the center-city. Archbishop Daniel expanded the archdiocese’s ministry to young adults by starting a Theology on Tap program, adding new college campus ministry programs, and creating new archdiocesan staff positions to provide outreach to young adults. In 2003, Archbishop Daniel established the ministry of permanent diaconate in the archdiocese. The first class of 25 deacons was ordained in 2008, and the ministry continues to flourish. Archbishop Daniel founded the Bishop Simon Bruté College Seminary in Indianapolis in 2004, to prepare college seminarians for major seminary. The seminary quickly attracted young men discerning a vocation to the priesthood and today has nearly 50 seminarians from 10 dioceses. Archbishop Daniel also expanded the services of Catholic Charities and social outreach ministries of the archdiocese. The archdiocese in 2009 opened a 30,000-square-foot shelter for homeless families, the Holy Family Shelter, located on the west side of Indianapolis. The financial health of the archdiocese also improved under Archbishop Daniel’s management. During his tenure, the archdiocese raised $300 million through the annual stewardship appeal and separate capital campaigns to pay for building projects and ministry needs throughout the archdiocese. After a series of significant budget deficits, Archbishop Daniel guided the archdiocese back to firm financial footing and break-even budgets. He also oversaw the dramatic growth of the Catholic Community Foundation, which oversees the archdiocese’s endowments. During his tenure, 337 endowment funds with a value of more than $100 million were established. He suffered a mild stroke on March 18, 2011, and was admitted to St. Vincent Hospital in Indianapolis. On August 1 he sent a letter to the Holy Father asking, for reasons of health, to resign from his responsibilities as archbishop and to return to Saint Meinrad. Pope Benedict XVI granted his request, and the Archbishop took up residence in the monastery infirmary in October. He continued his office of teaching as his health permitted, publishing in 2013 the book, Surprised by Grace: Memories and Reflections After 25 Years of Episcopal Ministry.